Get ready to enjoy a great ATV tour and add more excitement to your vacation! Come and experience the thrill of ATVs in rural Cozumel on this unforgettable experience. Grab your gear and hop on your own ATV for a great hands-on adventure, where you'll be exploring treasures within the heart of Cozumel's jungle. Our adventure starts by riding your own ATV through the back roads of wild Cozumel. We will then arrive to a private nature preserve, where you can enjoy walking on great trails that surround the Mayan village of El Cedral. Nearby you'll find the exotic Jade cenote where you can swim and admire its stalactite formations. 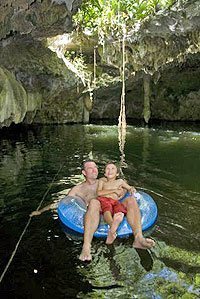 Then you continue the fun as you drive through the ancient Mayan Coral Cave, where you'll get an idea of what the Mayan life was like on this ancient Mayan habitat. It's going to be a wild adventure so be prepared to get dirty! Drive your ATV through rural paths for 1 hour of pure hands-on off road drive! Visit an exotic cenote and ancient Mayan coral cave! Swim in the calm, fresh waters of this unique and special Jade Cenote! Cruise Passengers: Yes, This tour is a great choice for all cruise passengers. When: Monday to Saturday at 10:30 AM and 2:30 PM. Where: Tour Offices in El Cedral. Exact Meeting Instructions Will Accompany Your Confirmation. Round-Trip Transportation from Hard Rock Cafe (walking distance from the Puerta Maya and International Cruise Piers) is available for $15.00 per person, paid in cash upon check-in. How Long: 3.5 Hours Approximately, Including Transportation. ATV Riding Time is Approximately 2 Hours. Kids: Ages 10 and up. Must be 16-18 years old with a valid drivers license to drive your own ATV. Prices are Per Person, and include all taxes and fees. Extra Cash for Pictures, Tips, etc. Note: This tour is not available to Pregnant women, and guests with back/neck injuries, or heart conditions cannot participate on the excursion. Maximum weight is 320 lbs. (145 Kg.) per person. Closed-toe shoes are mandatory. Transportation is $15.00 Per Person, and can be paid in cash on the day of service.